Help take Transition to the next level. Meet and network with other Transition groups from the region. Be inspired by successful community resilience projects. If you have helped to organize or have participated in your community's Transition initiative, or are simply interested in learning more about this thriving movement, this is a must-attend conference. Engaging more diverse communities in Transition -- Engaging more community diversity of all types, including communities of color, youth, income levels, etc. REconomy and Transition Enterprises -- What are the next steps for re-designing our community economies to become more sustainable and resilient? Plus: Open Space session, Inner Transition exercises, regional networking time, and guest speakers including Pam Hartwell-Herrero Mayor of Fairfax, Kirsten Schwind from Bay Localize, Marco Vangelesti from Slow Money and many more. Join us for dinner, music, a movie, and a community dialogue about food, farmers, and family and our global connection to each other through the use of genetically modified seeds from U.S. corporations and the controversial Prop 37 ballot initiative. neighbors. We will have purple tree collard cuttings to give away. Do you have too many tomatoes/zucchinis/ lemons or something else in your garden? 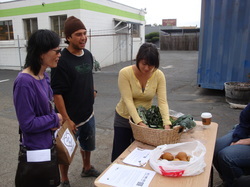 Come to a Crop Swap and trade your excess produce for something you don’t have. Meet with your neighbors, trade gardening tips, recipes and help out your community. 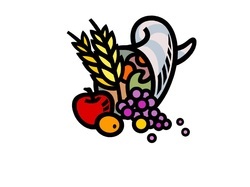 Excess produce can be donated to a local food pantry. Do you have too many tomatoes/zucchinis/ lemons or something else in your garden? Come to a garden produce swap and trade your excess produce for something you don’t have. Meet with your neighbors, trade gardening tips and help out your community. Excess produce can be donated to a local food pantry. Put these 2 special events on your calendar. Check back here for info updates. What would an exceptional, local, sustainable health care system look like in Albany? With our current lifestyle and expectations now facing all kinds of challenges -- from the rising cost of gas (and anything that needs gas to reach us) to economic contraction -- our community could breathe easier knowing that our basic health care needs can be met largely at home. This afternoon is designed to help us reach that point. When we come together as a community of health care providers and residents, we can craft solutions together that we might not think of alone. We will be guided by Open Space facilitator, Saundra Leigh, to form groups around our own visions and passions to begin planning a future health care system that can meet our immediate needs at home. Afterward, with the contacts we have made, we can begin implementing the ideas we generated. We welcome ALL interested community members (not just those in health care). Come and meet old friends and make new ones.This is history in the making! Please arrive promptly at 1 pm and plan to stay the whole session. Bring your business cards and flyers. We will provide tea and snacks. Your donation would support our facilitator and pay for materials. Please join us for the Richmond Rivets 2nd annual Alternative Caroling Party on Monday, Dec. 20th. at 6:30-9:00. Last year we inaugurated our Richmond Transition Town with a wonderful, fun event consisting of a pot luck and then going around Trish's neighborhood singing alternative holiday carols (see sample). 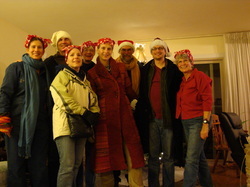 This year we will be at Rebecca's house, 624 31st St., so we'll be caroling around the North & East. Please bring a pot luck dish (preferably with local ingredients), warm clothes and holiday spirit. As an added attraction we will be able to view the total lunar eclipse as we are caroling. Feel free to invite others you think might enjoy this event. This two-day course is an in-depth experiential introduction to Transition for those considering bringing Transition to their community. It's also great background for those considering joining an existing Transition effort (such as Rivets). The course describes how to catalyze, build and facilitate a successful Transition Initiative. It is packed with imaginative and inspiring ways to engage your community, and delves into both the theory and practice of Transition that has worked so well in hundreds of communities in the U.K. and around the world. It was a beautiful day with food, music, prizes and most of all sharing with neighbors. Do you have too many tomatoes/zucchinis/ lemons or something else in your garden? Come to a Garden Produce Swap and trade your excess produce for something you don’t have. Meet with your neighbors, trade gardening tips and help out your community. Excess produce can be donated to a local homeless shelter. Join Mayor Gayle McLauthlin to hear about her recent experience in Mondragon, Spain learning about the successful worker-owned cooperatives that have been part of the economy there for over 50 years. These cooperatives in manufacturing, retail, financial services and education have brought prosperity and social equity to a region that had been stricken by high rates of poverty and unemployment. The Mayor is committed to exploring the potential for worker-owned cooperatives here in Richmond. Please come and share your ideas at one of the events below. 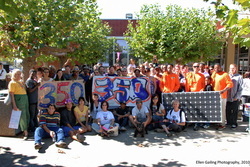 On Sunday, October 10th, 2010 Richmond citizens joined thousands of others around the world to help fight climate change. This global event was created by 350.org to encourage people to get to work on local climate solutions and let our leaders know we are serious about climate change. 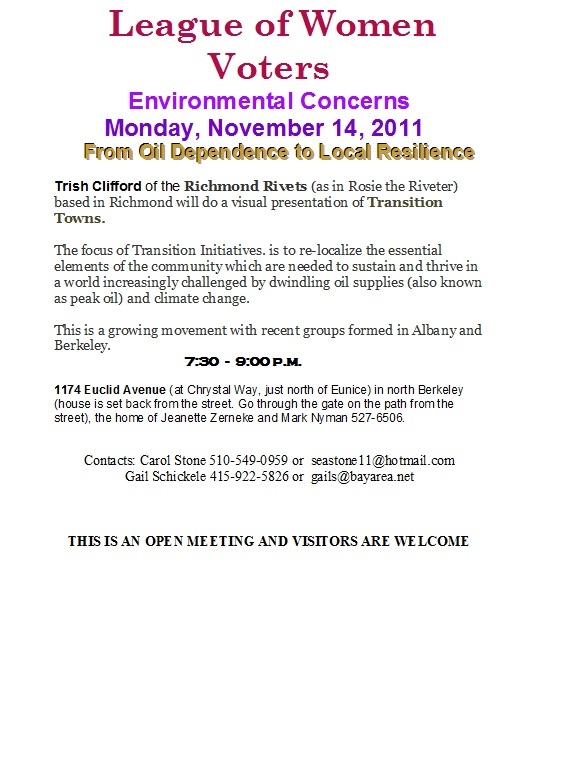 The City of Richmond and Richmond Rivets Transition Town organized our local event. The day started with hundreds of people lining up, some of them 2 hours early, to get free compost. The compost came from our own green waste and food scraps and was made here in Richmond by Richmond Sanitary Service. By the end of the day enthusiastic gardeners had emptied two huge dumpsters. The main event, which was across the street at the Main Library, featured free plants, produce and garden tools. Sunnyside Nursery gave away hundreds of organic vegetable seedlings grown at their refurbished greenhouses in North Richmond. 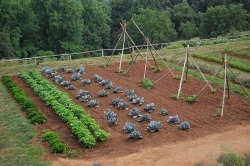 Sunnyside Nursery is just one of many efforts to revitalize our many agricultural traditions. Another is Urban Tilth’s planting food crops for all to share on the Richmond Greenway. There was a workday on the Greenway as well as a Healing on the Greenway workshop by CURME, a group that also builds community gardens in North Richmond under the Lots of Crops program. Making Waves Education, a group that maintains the community garden at the Library, planted vegetables including some purple tree collards, Richmond’s official green. Mayor Gayle McLaughlin, Vice-Mayor Jeff Ritterman and County Supervisor John Goia were in attendance and gave their wholehearted support to our many sustainability efforts in Richmond. Mayor McLaughlin pointed out that Richmond had recently received awards for having the highest per capita installation of solar power in the Bay Area, for our green jobs training program and our newly remodeled, highly energy-efficient (LEEDS Certified) Civic Center. She also talked about our bicycle and pedestrian proposal which is being announced soon, our solar manufacturing industry (Sun Power), and many other plans for sustainability. Delicious, healthy food was offered free to participants thanks to the generosity of Sunrise Bakery and the City of Richmond. The food was of course served in compostable containers in accordance with the City’s Styrofoam ban. No on Proposition 23 – To register people to vote and give them information on this proposition that is attempting to roll back our landmark global warning bill, AB32, in California. Richmond Rivets Transition Town – Offered a presentation on this effort to localize all the elements our community needs to thrive – food, water, energy, transportation, housing, etc. People left with not only lots of food and fertilizer for their gardens, but with more energy, and inspiration to keep building our community towards a sustainable, just future. Many of us are involved in making Richmond a model city of the new economy. Come join us for an evening celebrating what we are all doing, and for an introduction to the Transition Town efforts happening right here in Richmond! * There are now Transition Towns in hundreds of communities worldwide and over 70 in the US,(Transitionus.org) including Richmond (RichmondRivets.org). All the while mingling with friends old and new and enjoying light refreshments. We look forward to seeing you!! If you'd like, bring something to share maybe from your garden or local farmer's market. Feel free to forward this invitation to any of your neighbors in Richmond or nearby communities that might be interested. Also, this event was sent out as an Evite to many people. If you would like to receive an Evite for this event please email us at TransitionRichmond@gmail.com. This free film show is cosponsored by the Richmond Progressive Alliance and the Peace & Freedom Party, Contra Costa County Central Committee. Richmond Rivets will also be there. and conserving energy, sharing with our neighbors and more. Sunday, June 6, 2010 1:30 p.m. – 6:00 p.m. Reception: Live music by Shambu, wine and appetizers . Local sustainability groups will be there including a Transition Town table hosted by Richmond Rivets, Transition San Fransisco, Albany and East Bay. On the weekend of February 27-28th, the school communities of Richmond High School and Kennedy High School will be building 2 school “farms” in 2 days! These farms will grow food that directly changes the food landscape of the families in the schools of Richmond. And best of all, the farms will be built by the students, teachers, parents and community members surrounding the schools. These “farms” will accompany Urban Agriculture Institutes at both schools where students will learn not only how to manage the farms, but earn graduation credit, learn better nutrition and build and beautify the school community. Richmond and Kennedy High will be the first High Schools in California to run a food production program that is student centered, service oriented, and entirely focused on producing healthy food that feeds the community from which it came. Support that premise and begin to bring change to our public schools. For more information about helping to raise funds and volunteering, please visit the Urban Tilth website. When: Monday, January 18, 2010 - 10:00 a.m. - 2:00 p.m.
As part of broader efforts across the United States to honor the spirit of service championed by Dr. Martin Luther King, Jr. the Richmond Rivets will be participating in Richmond Greenway Restoration activities, and hope you will join us. Please dress in layers, wear sturdy shoes, and bring work gloves if you have them. All tools and materials will be provided - Children are welcome! For more information contact Doria Robinson 510-778-5886 or Doria@urbantilth.org. 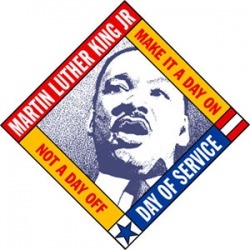 The 3rd Annual Martin Luther King National Day of Service is sponsored by the City of Richmond. 5% Local Coalition, Active Leaders of Today, Catahoula Coffee, Communities Unified Restoring Mother Earth, Earth Team, East Bay Bicycle Coalition, Friends of the Richmond Greenway, Groundwork Richmond, Native American Health Center, National Parks Service, Opportunity West, Party Green, Richmond High Cooking Club, Richmond Spokes, RYSE Center Leadership Team, The Watershed Project and Urban Tilth.